If anyone knows of any inaccuracies on this webpage, Email ME here (remove the NOSPAM. part from address and change subject to 'Inaccuracy report Musicians') and I will correct them immediately upon verification. hollowbody guitar luthier, acoustic/jazz/jazz electric, banjo, mandolin, bass. Serious $$$ and only. A few Atlantic/WB artists use his guitars. formely worked with Leo Fender at Fender Guitars and at MusicMan Guitars and helped design the Saber and Stingray. Dean Guitars, good quality Korean made guitars, just replace the pickups with USA boutique pickups and you'll have a great players' guitar. They sell a few USA made guitars that are great. you've got to see these for yourself. Merlin 5 Products, 2572 E Fender #B, Fullerton, CA 92831, (714)879-7508, has provided the music industry's leading guitar builders with the finest hardware made. 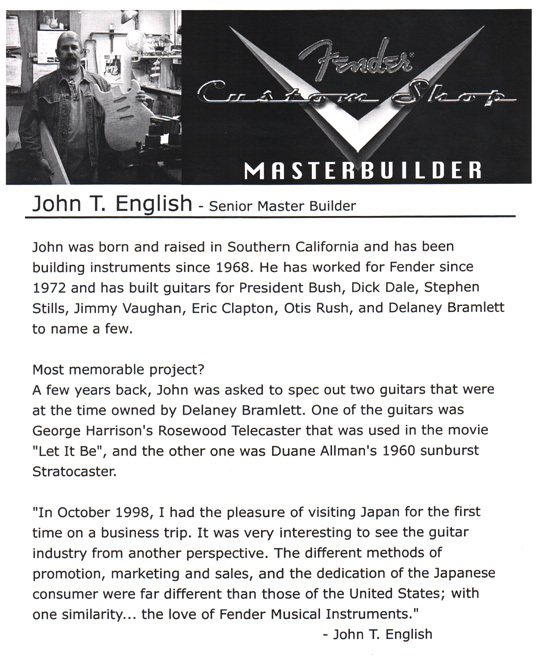 Fender, Jackson, Rickenbacker, G&L, Yamaha, and countless other small builders have benefited from his vast experience in the machining world. He has worked with the best, Grover Jackson, Gary Kahler, and Wayne Charvel just to name a few. Bill Gerien's company makes hardware and CNC products and tooling for G&L guitars. Bryan Galloup is an extraordinarily skillful guitar restoration luthier and custom guitar builder and has been featured in many guitar magazines. the real Gibson guitars made by the same people who made the early ones in the same factory with the same equipment are now sold as "Heritage Guitars" (see link below for "Heritage Guitars"). Gibson Custom Guitars are their custom shop Gibson guitars, not the mass produced and imported ones. Former Gibson custom shop builder Gene Baker is selling guitars under his own name (see link above for "Gene Baker"). Former Gibson custom shop builder Roger Giffin is selling guitars under his own name (see link below for "Giffin Guitars"). Everybody complains about how overpriced Gibson guitars are and how they've declined in quality. Some people consider Tokai Love Rock guitars to be superior to Gibson USA guitars. Get a "Heritage Guitar" or "Gene Baker" or "Giffin Guitar" for the real thing. The #1 USA dealer is Centre City Music in San Diego, CA. Warning: only USA-made Gibson guitars are collectable and increase in value, all OEM'ed and imported Gibson/Epiphone-rebadged guitars depreciate quickly and steeply. Gibson stopped making Epiphone guitars in the USA in 1970.
former head of Gibson West Coast Custom Shop in Los Angeles for 5 years, co-owner of R&B Instrument Services at Guitar Center in Hollywood, owner of Giffin Guitars London in England for 25 years. He has lots of big-name clients. went out of business a long time ago, this new company is owned by Fender Instruments. Old Gretsch guitars looked great, but never played well. Some Gretsch guitars have crappy versions of the Bigsby tremolo that don't allow for individual string intonation; they go out of tune badly as you play up the neck. Their more expensive guitars are made by Terada-Gakki, Nagoya, Japan with pickups made by TV-Jones. Their lower priced guitars are made by Korean guitar maker Kimaxe who sells the same guitars under their own brand and "SamAsh Carlo Robelli" brand with pickups that'll remind you of the 1950's Gretsch pickups, but don't sound like them. Kimaxe guitars sold as "Kimaxe" sell for a fraction of the Gretsch branded guitars; you can save yourself a lot of money by buying a Kimaxe Guitar and installing TV-Jones pickups and you'd have a "Gretsch" guitar. Their websites and advertisements sell the idea that these guitars are part of the Gretsch legacy, but the real Gretsch company died when Baldwin bought them in the 1960's. Baldwin ruined Gretsch in the same way CBS ruined Fender, and Gretsch's reputation never recovered. Too bad Gibson guitars didn't buy them out, but then again, Gibson bought Epiphone and is now just slapping the Epiphone name on the same Korean Samick-made guitars. Go find out what a similar Samick guitar costs, add the price of TV Jones pickups, and you'll see how much these guitars are actually worth. These are terribly overpriced and you can actually buy a used pre-Baldwin one for much less than a "new" one. The only redeeming factor to Gretsch guitars are some models' installment of pickups made by Tom Jones of TV Jones Guitars. Gretsch now has a new line of TV-Jones/Rich Modica USA-made guitars marketed as "Spectra Sonic" guitars; these are probably their only collectable guitars. Buy a used Gretsch, a TV Jones, or a Jim English guitar for higher quality and lower prices. TV Jones Pickups is an OEM supplier to many guitar manufacturers including Koll Guitar Company, Baker Guitars, GMP Guitars, Fender Custom Shop, Jim English Guitars, Birdman Guitars, CB Hill Guitars, and TTR Design Co.
guitars that teach you how to play the guitar, actually Fender guitars with "GVox" pickups installed, please email me if you have any GVox software! Italia Guitars, guitars that look like those old (cheap when they were made) guitars complete with metalflake finishes. The advantage here is that they are modern guitars without the maintenance problems that you often see in their ancestors. Thomas Vincent Jonestsch pickups such as his Tele Model 2, has had good reviews in Guitar Player Magazine. Serious $$$ and only. A few session musicians use his guitars. John Hornby Skewes, UK, makes and distributes imported instruments including the brands: Encore, Vintage, Vintage Metal Axxe, Falcon, Manuel Rodriguez UK, Palma, Santos Martinez. These Asian imported guitars are perfect for modifying with upgraded aftermarket pickups and parts. Vintage Guitars are clones of Gibsons, PRS, Peavey, Jacksons, Fender, MusicMan guitars and basses. Line 6, their new "Variax modeling guitar" models an entire guitar collection in a single instrument, models others guitars!! very good Canadian guitars, they look like Pre-BBE G&L guitars. great guitars made from the same factory by the same people for many decades. President John Hall is keeping the brand's standards high, and prices high too. Rondo Music, SX Guitars, Agile Guitars, Valencia Guitars, Brice Basses, CNB Cases, Drummer's Design and Century Drums, Hoffman Violins. Very good prices. Stuart Custom Guitars, Alan Hamel and Fred Stuart make "Fender Custom Shop" guitars and their own "Alan Hamel & Fred Stuart"/"A&F Guitar Services" branded guitars out of their garages miles away from the official Fender factory. As you may know, when Fred Stuart and Alan Hamel left the Fender Custom Shop, (in 2001) they formed A&F Custom Guitar Services. Along with their line of guitars, they also offered pickups. In 2003, A&F Custom Guitar Services ceased doing business. That same year, Fred Stuart began Stuart Custom Guitars. Stuart Custom Guitars Black Guard pickups have the same specs as the "old A&F 's". The only thing that is different from the A&F's, is that Fred's have more consistent output and tone. is another fine luthier crafting expensive, fine acoustic and electric arch top guitars. Fender Amps, worlds most popular amps by the world biggest amp company. Fender invented their Bassman amp which is the model that most other guitar amp manufacturers derived their designs from. They make dozens of similar models so that their many dealers in close proximity don't have to compete against each other on price, this is known as "confusion marketing". Fender tube amps sound great but have cheap flimsy plastic buttons, most of their imported solid state amps sound like junk except for their great sounding Mexican-Acoustasonic amps. Fender's discontinued Acoustasonic Pro was a great amp. Fender's USA made amps, especially their Custom Shop and Master Built amps, seem to be instantly collectable while their imported amps are not collectable. Fender bought competing brands Sunn Amps and SWR Amps and seems to be shelving them; Fender can't stand competition. I'm not sure what to make of their Mexican tube amps which look good, but may depreciate steeply. Andy Fuchs Audio Technology Designs, Dumble derived clones, he also modifies other amps to become Dumble clones, he "allows you to obtain high performance amplifiers at a fraction of the price of a so-called 'botique amplifier'. Whether it's audiophile or musical applications, if you own the chassis and transformers, your amplifier can be rebuilt to your needs." Jeff Rowland Battery Power Supplies takes the "clean power" concept to the ultimate extreme; check out their rechargable Battery Power Supplies. If you use these rack mountable Battery Power Supplies to power your gear, you will never have to worry about losing power again, no more embarrasments on stage, no more shocking short-outs, no more power line noise. This is the ultimate fool-proof device for power. Roland Amps, their famous JC120 is a great amp, but the rest of their modeling amps have crappy speakers and sound the same regardless of the settings - as if you really could get a Marshall Stack sound from a crappy 8" speaker. Their Cube and "Tube Logic" amps sound like crap. Sonic Machine Factory, a second company run by Mark Sampson of "Bad Cat Amps" and "Star Amps" and formerly of "Matchless Amps"
Standel, Los Angeles, CA, These great guitar amplifiers are back! their combo amps have 15" speakers, made famous by Chet Atkins, Jefferson Airplane, Jerry Garcia, and many others, the "standard" for slide guitars, call Frank Garlock at (800)748-5555 for info on where you can try one out for yourself. Boutique Amplifier Links: Ultimate Guitar Gear, an information center for many great amps and pedals, they organize "Toneparties"
Everyone wants to be an axeman by Chris B. Some Things to Look for in Purchasing a Guitar by Chris B. Information: How is an electric guitar different from an acoustic guitar? "Cost Cutting, What Does It Really Mean"
"Magazine Reviewers (Can you trust them?)" Information: "How An Instrument Earns Its Reputation"
Information: "Differences Between Handmade and Factory Made Guitars"
Information: "Buying a High Quality Guitar or an Inexpensive Guitar"
Information: "Collecting America's Musical Heritage"
Les Paul interview: "... So I realized that many people hear with their eyes." Commentary: "Mr. X - a former music store employee discusses Gibson Les Pauls"
Information: "Guitar Collections", in case you're wondering where all those expensive boutique and vintage guitars are going, they're being hoarded by collectors - not musicians. This wealthy crowd is responsible for driving up the prices as they sell the same gutiars back and forth to each other. Just because a dozen people are foolishly willing to waste thousands on guitars, that doesn't mean everybody else should be shut out of the market for quality guitars. They are also the bullies on the internet newsgroups as they flame and harrass anyone who dares critisize any of their investments. The most famous Japanese guitar collectors are Akira Tsumura and Mac Yasuda who have accumlated huge collections of extremely expensive guitars. Fender in the 1950's and 1960's used to include with each new guitars a plastic cover that would fit on the back of the guitar to protect the finish from scratches. Fender also used to include covers for their Telecasters and Stratocasters to cover the bridges; CBS' costcutting cut those covers and Fender today does not include them with their new guitars, not even on their supposed "reissue" guitars; only their custom $hop guitars have them. Piranha Guitar Bow violin-style finger bow for creating new guitar sounds. Guitar Parts Maybe the best guitar in the world, best playing, best sounding, and the one that will have the most personal value to you is made by ... you. You can buy the parts, get an instruction book and put it together yourself or find a technician at any of the dealers listed on this page and they can assemble it for you. You can also consider buying an imported guitar that uses solid woods and swapping out the pickups, hardware, and tuners. The quality of many imported guitars, some of which use solid woods such as Ash and Alder, is quite good and you can buy a Yamaha or Korean made Samick guitar (in any of the dozens of rebaged incarnations) for much less than a neck or pickup by an aftermarket manufacturer. The entire parts aftermarket was created for musicians who modify import guitars. Beware that the marketing terms for pickups - "hot", "cool", "bluesy", "vintage" - are completely meaningless unless they refer to how they were made with what materials. Beware that many "American" parts are actually OEM'ed from Asia: Gotoh (Japan), Kent Armstrong (Korea), and others; you have to research the brands so you won't end up replacing the "cheap" imported pickups and hardware with more "cheap" pickups and hardware - from the same manufacturer. Many musicians leave their "trophy prize" guitars at home and use them only for recording and take their modified import guitars on the road for shows. Good places to find parts are guitar shows where usually every dealer sells parts left over from guitars they've modified. You can easily modify an imported guitar such as Sam Ash's "Carlo Robelli" guitars with better pickups. You can go to a dealer of "cheap" imports such as Highland Park Music and Pawn (listed above) or FirstCash.com and buy a Gibson, Fender, MusicMan, etc., clone guitar by Jay Turser and swap out the pickups and hardware with USA made parts and you'd have a pretty decent guitar. Article: How electric guitar pick-ups work? Robinson Inlays by Larry Robinson, he does work for other brands' "custom shops"
Timbre Technologies, 12823 Foothill Boulevard, Unit F, Sylmar, CA 91342, company founded by luthier Michael Tobias and SWR amplifier builder Steve Rabe that makes guitars "Instant Vintage"
Red Rhodes Velvet Hammer Pickups, Red Rhodes passed away in the mid 1990's so his pickups are rare and extremely sought after by musicians. You can call Rick Benson at Groove Tubes 818-361-4500 to see if he has any. 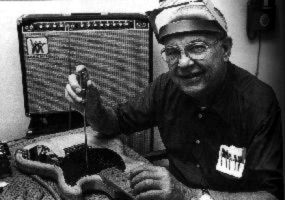 Red Rhodes was a musician and inventor of the Velvet Hammer pickups and was an old friend and mentor to DeTemple Guitars. Red was doing 3 sessions a day for 5 or 6 years -- he was the No. 1 pedal steel guitarist, and made the very first Fender pedal steel guitar with Leo Fender himself in Leo's garage. Patrick Ralph Wilkins, Van Nuys, CA, guitar painter for Tom Anderson Guitars, Sadowsky Guitars, Pensa-Suhr Guitar, Zion Guitars, Norm's Rare Guitars, Gibson West Guitars, Ibanez Guitars, Yamaha Guitars, 48th Street Music Guitars, PRS Guitars, and Tobias Guitars - you didn't think all those companies actually painted their own guitars, did you? haha! you didn't think that import companies actually had the capability to make "show" guitars or their "flagship models", did you? you don't get the guitar business! Guitar Cases and Gig Bags Guitars are supposed to come with matching caes, but dealers like Guitar Center sell the cases seperately from the guitar so the guitar price looks lower. Gibson, Fender, Martin, Taylor, and many others are supposed to come with cases. I don't care what some guitar show dealer told you, guitar cases are NOT collectable. Unless you have some special custom guitar that requires a special custom case or you spent a huge amount of money on a custom guitar and custom case, guitar cases don't increase in value as vintage guitars do. If you buy a Gibson guitar, get yourself an Epiphone case. If you buy a Fender guitar, get yourself a Fender Squier case. It seems to me that some Fender Squier hard plastic cases are actually bigger and better than Fender's USA tweed cases which eventually get tattered. Tweed and tolex cases look nice when they're new, but later they get ripped and ratty looking. Guitar cases receive the brunt of abuse when traveling and eventually they get mildew and smell bad. Gig bags are for transporting your guitars to gigs you can drive to, guitar cases are for transporting your guitars to gigs you have to fly to or travel long distances to. If you have lots of money, go ahead and get the case made the by manufacturer of the guitar. Tweed and tolex USA cases do look cool, but nobody really cares about "vintage" guitar cases when buying a "vintage" guitar. Anvil Cases are expensive professional cases for professional touring musicians. These are the ultimate cases for international touring. But most professional touring musicians rent these cases when they rent their equipment for the tours. Nobody wants these bulky things clutting up their houses. Some are heavier than the equipment they're supposed to protect. Article: "Today's Prices Are Bargains, Amp Prices Then and Now"
Article, Rod Elliott: "The Whys And Wherefores of Guitar, Bass and Keyboard Amps"
Article: "Amplifier Myths, Fantasies, and Facts"
Article: "Tubes, Mechanics & Mystique"
Article: "Glossary of Speaker Terms"
Article: "Is Point-to-Point Better Than PCB?" Article: "Amp Talk, One Mans Opinion"
Article: "A Beginner's Guide to Buying a Guitar Amp"
Article: "Top 10 Things to Consider When Buying a Guitar Amp"
Article: "Buying a Guitar Amplifier"
Article: "Tube vs. Solid-State Amps"
Article: "Basics of Tube Amps for Beginners"
Article: "Musical Instrument Tube Amp Building, Maintaining and Modifying FAQ"
Article: "Buying a guitar amplifier ..."
Article: "TUBES VS TRANSISTORS "
Article: "How we get that Groove Tubes sound"
Article: "Harry Kolbe's article about attenuators"
Once you've heard the real effect pedals, you'll realize that the digital modeling amps and programs don't match the originals. The most essential pedal that every guitarist ought to use is the Roland noise gate. Most pedals are made out of cheap plastic parts, assembled in China and are ridiculously overpriced. Unfortunately once Asian manufacturers realized that customers will buy on perceived value, they too overcharge as high as the market can bear. Some boutique pedals stand out because they are made by single builders, have metal boxes, are hand made, and priced for exclusivity. I like the "Zoom GM200 Modeling Guitar Multi-Effects Processor", but it is so cheaply constructed and so ridiculously overpriced with ridiculous cosmetics (fake metal case, really cheap parts), I can't recommend it for serious touring. Buy used pedals and let somebody else take the hit of initial depreciation. Perhaps the Apple iPad guitar amp modellers will replace pedals. Korg DT-7, has the Buzz Feiten tuning system. After years of testing, my favorite effects pedals were Korg's Toneworks Hyperperformance Products: Hyper Distortion Pedal 104ds, Dynamic Echo Pedal 301dl, all of which were ridiculously overpriced and are discontinued. Jeff Rowland Design Group Products takes the "clean power" concept to the ultimate extreme; check out their rechargable Battery Power Supplies. If you use these rack mountable Battery Power Supplies to power your gear, you will never have to worry about losing power again, no more embarrasments on stage, no more shocking short-outs, no more power line noise. This is the ultimate fool-proof device for power. Article, Forbes Magazine: "Sizzle Sizzle Sizzle"
Article, Caelin Gabriel: "Why Power Cables Make a Difference"
MUSIC INTERFACE TECHNOLGIES, Leonard Sanchez's company at the last NAMM convention demonstrated their new Ripcord guitar and bass cables which are audiophile quality. He also sells GAS Terminator amp to speaker cables. Use these for serious studio recording. Unfortunately, their advertising for these products is full of pseudo-science. Planet-Waves Cables, Circuit Breaker cables are interesting, but how hard is it to turn your amp to "standby" mode ? There are two easy ways to find a good dealer near to you. The first way is to go to Yelp, enter your zip code, and search for "music instruments" in the Local Listings. The second way is to go the websites for the biggest manufacturers, namely Fender and Yamaha, and look for dealers in your area. Any dealer that carries Fender or Yamaha probably carries other brands' products too. Search the Fender website for dealers close to you that sell their "Custom Shop" guitars. Guitar Center, has many stores nationwide. Time Magazine - A Store Strikes A Chord. The End of Guitar Center. Ed Roman Empire, Ed Roman Guitars, Las Vegas, NV, one of the most incredible guitar stores in the world!! George Gruhn Guitars, Nashville, TN, one of the first used guitar dealers, writer for magazines, designed guitars for Guild and Tacoma, but he sells every guitar as being "rare"
Ishibashi Music Co.,Ltd., Japan, Ishibashi Music Co.,Ltd. These are clear acrylic Crystalite drums, that is clear plastic drums, reminiscent of the Pearl set used by Led Zepplin, Pearl Crystalites or Ludwig Vistalites. They sound incredibly good. HipTriX "World's Brightest Glow-in-the-Dark Drumsticks"
Clinics are scheduled for the second Tuesday in the the month. "e-Books for the Home Recording Studio owner who wants to go Pro"
dealer of jukeboxes. Located where the original Fender guitars was located. BandNameMaker.com, web site the generates potential names for your band. Miscellaneous Materialism causes Depression! Affluenza is bad for you. The guitar magazines are very demoralizing and depressing because they constantly feature and praise extremely overpriced expensive gear that very few people can afford. Even if you were rich, paying thousands for gear is hard to justify. Guitar magazines exist in an "unreal" world where $2,000 gear is sold as "entry level" and guitars around $1,000 are "bargains." Materialism leads to anger and makes people feel like "losers", insecure, inadequate, self-hating, and damages self-esteem. Turn your back on materialism and realize that you can buy high quality gear avoiding the "name" brands and buying off-brands. Cancel your subscriptions to guitar magazines and let them know that you are sick of them catering to yuppie collectors who buy overpriced gear as hip wall decorations. Buy only USED equipment and let someone else take the "hit" of initial depeciation - besides, 2nd hand speakers sound better than new ones because they've already been broken in. Let the magazines sell their "bigger and more expensive is better" philosophy to a shrinking readership. You can buy an imported Yamaha or Korean made guitar, swap out the pickups with USA made Seymour Duncans, and have a great sounding guitar. Ibanez guitars are actually the most playable import guitars with the "fastest" fretboards, best tremolos, quality construction, and quality hardware. You can buy high quality custom made in the USA gear by G&L. Fender/Gibson/Rickebacker/Marshall are targeting the boutique markets with outrageous prices, so screw them. NAMM's museum of musical instruments. The primary source of employment for musicians nationwide, established 31 years. Jobs and resumes are updated online daily. from the National Institute for Occupational Safety and Health (NIOSH). Music Pad Pro, tablet-shaped PC with a fast screen. You can download and display music on it, you can even turn pages with a footswitch. It's got a touchscreen and a storage capacity of 10,000 pages of music. founded in 1967 to celebrate and promote the music of the Spanish classical guitar in Orange County, California, and surrounding communities. They hold 9 recitals a year at Chapman University in Orange, on the third Saturday of each month (except December) between September and June. I.Q. learns the sonic spectrum of a take, track or song? mono or stereo? then constructs a complex filter that matches the spectrum of the new material to that of the original reference material. Most of the pop stars that get on MTV, MTV's TRL, and all the media attention are no-talent acts hired for their looks and dancing ability, not musical talent. So when these "acts" are not lip syncing and have to do a live show, they use this device. The Antares Auto-Tune does realtime auto pitch correction to make sure that whatever comes out of the mouths of the phoney pop stars into the microphones comes out in tune. It's impossible for even the best talented singers to breathe, dance widly, gyrate on stage, and sing on key. The MTV eye candy pop stars simply would not have careers at all if it was not for this machine. Most of the pop stars that get on MTV, MTV's TRL, and all the media attention are no-talent acts hired for their looks and dancing ability, not musical talent. So when these "acts" are not lip syncing and have to do a live show, they use this device. The Melodyne Auto-Tune does realtime auto pitch correction to make sure that whatever comes out of the mouths of the phoney pop stars into the microphones comes out in tune. It's impossible for even the best talented singers to breathe, dance widly, gyrate on stage, and sing on key. The MTV eye candy pop stars simply would not have careers at all if it was not for this machine. Most of the pop stars that get on MTV, MTV's TRL, and all the media attention are no-talent acts hired for their looks and dancing ability, not musical talent. So when these "acts" are not lip syncing and have to do a live show, they use this device. VocALign Project is an editing tool which will automatically synchronise two audio signals at the touch of a button. VocALign massively speeds up audio synchronisation tasks and increases the quality of results. It's impossible for even the best talented singers to breathe, dance widly, gyrate on stage, and sing on key. The MTV eye candy pop stars simply would not have careers at all if it was not for these programs. The late Sam Hutton, former Fender Custom Shop amp designer, started his own business of custom amplifier covering. His son Don now continues his late father's work. Call him at (714)529-7531 and mention John Suhr (pronounced SIR) and me Andrew sent ya. 8. Gear used for pictures = famous gear! 4. Use the money you save to buy more used gear! 1. Three words: price price price!